The Stellars Jay is native to western North America closely related to the Blue jay. It’s found in the rest of the continent, but with a black head and upper body. It is also known as the Long Crested Jay, Mountain Jay and Pine Jay. It is the only crested jay west of the Rocky Mountains. 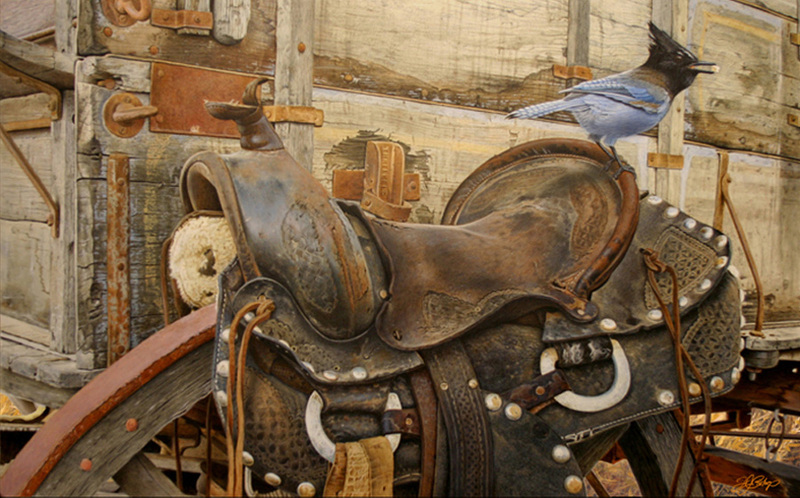 With Lucero’s Saddle, I had often noticed this old weathered saddle sitting on the wheel of an antique wagon at Loose arrow’s Nursery in Lake City, Colorado. 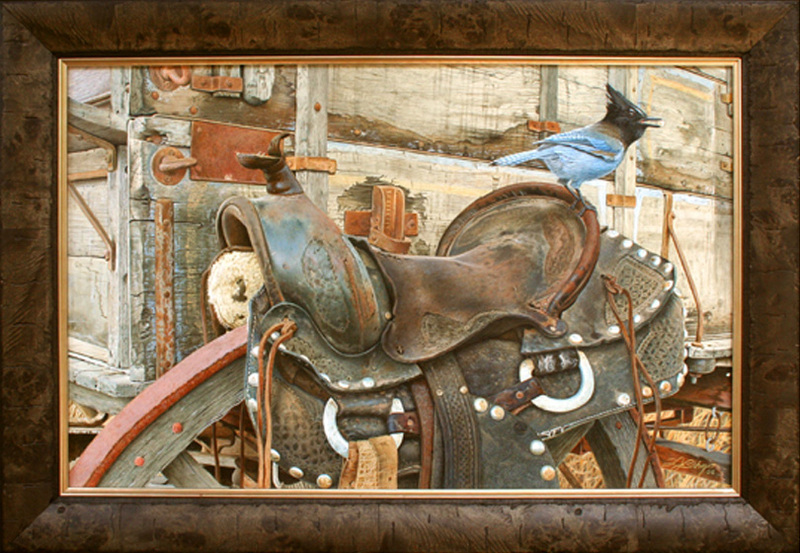 It had indeed caught my eye several times and in my heart I knew it was a wildlife art painting waiting to happen, my only dilemma was to somehow create a wild life connection. 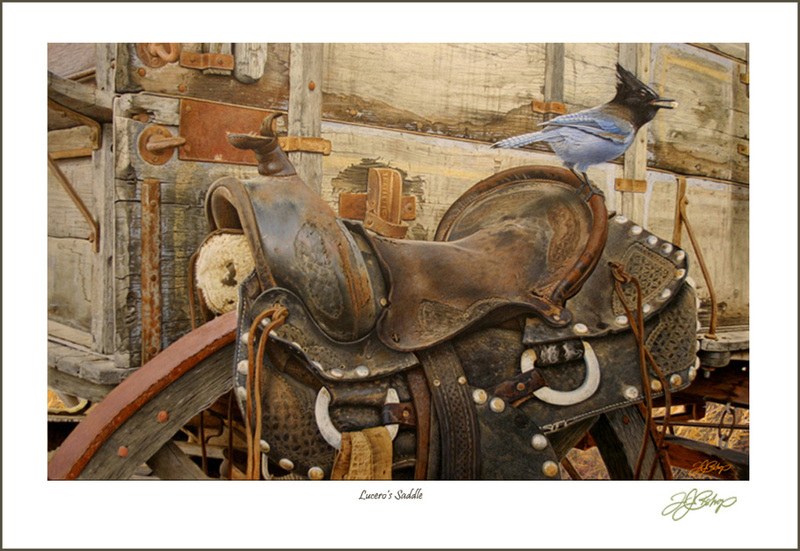 Then one day as I again was viewing the saddle, a Stellar’s jay flew up and lit on the back lip of the saddle’s seat. Like most jay’s they are brazen raiders of camp grounds and picnic tables, grabbing not only unwanted scraps, but those that are being eaten at the moment. This jay had just grabbed a bit of popcorn from a table at Poker Alice’s, a nearby restaurant and it’s timely arrival instantly completed the wildlife art composition that I had been seeking…..